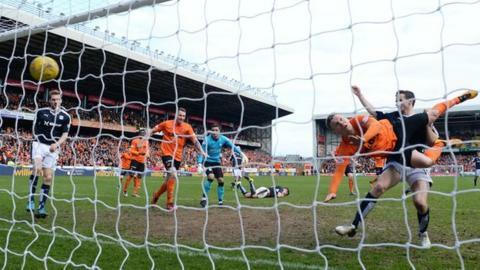 Dundee United boosted their hopes of Premiership survival in a blistering derby draw at Tannadice in which they came back from two goals down. Two first-half strikes from Dundee's Kane Hemmings left their city rivals toiling in a feisty match. But a brace from Billy Mckay - a penalty and a stoppage-time header - tied the match and United trail second-bottom Kilmarnock by seven points. Dundee finished with 10 men, Scott Bain dismissed for conceding the spot-kick. Paul Hartley's side do, however, leapfrog Partick Thistle into seventh place - three points off the top six and with three matches to play before the league splits in two. The 90 minutes lacked class but bubbled with drama. Tackles flew in and the ball was absent of some tender loving care. The physical nature of the game enforced a change for Dundee, Kostadin Gadzhalov departing with a shoulder injury to be replaced Thomas Konrad in what was to be a temporary arrangement. There was an acute lack of luck in the loss of the game's opening goal for United. Paul McGowan's shot was deflected and fell for Hemmings, who poked the ball beyond Eiji Kawashima. Agonisingly for Gavin Gunning in pursuit, it trickled over the line. There was another curious twist for Dundee when sub Konrad had to be replaced after just 24 minutes on the pitch, Nicky Low replacing him. There was to be more on that too. Dundee's second goal was another bizarre scenario. Stewart broke down the left with United screaming for offside as he found Hemmings just three yards out and unmarked. It should have been a tap-in but it took three clumsy touches to get the ball over the line. The second half had an explosive start with Mckay getting on the end of a Rankin pass and being brought down by Bain - a call-up to the Scotland squad for Thursday's match against Czech Republic. Referee Steven McLean deemed the challenge to have halted a clear goalscoring opportunity, despite Dundee players insisting that there had been a covering defender in Kevin Holt. Replacement keeper David Mitchell's first job was to face the spot-kick but to accommodate him United took off Low meaning that, maybe uniquely, the substitute who had come on for a sub had been subbed. McKay scored right down the middle. Mitchell performed brilliantly in the wake of that until, that is, the 91st minute. He came for a cross he had little chance of winning and substitute Edward Ofere managed to help the ball on for team-mate Mckay to nod in on the line. And it almost got better for United - Mitchell superbly blocking Gunning's header as time ticked away. Match ends, Dundee United 2, Dundee 2. Second Half ends, Dundee United 2, Dundee 2. Attempt missed. Callum Morris (Dundee United) header from the centre of the box is too high. Kevin Holt (Dundee) is shown the yellow card for a bad foul. Attempt missed. Scott Fraser (Dundee United) right footed shot from very close range is too high following a corner. Attempt saved. Gavin Gunning (Dundee United) header from the right side of the six yard box is saved in the bottom right corner. Corner, Dundee United. Conceded by Darren O'Dea. Goal! Dundee United 2, Dundee 2. Billy McKay (Dundee United) header from very close range to the centre of the goal. Assisted by Edward Ofere. Edward Ofere (Dundee United) is shown the yellow card for a bad foul. Corner, Dundee United. Conceded by Greg Stewart. Paul Paton (Dundee United) wins a free kick in the defensive half. Corner, Dundee United. Conceded by Cameron Kerr. Substitution, Dundee United. Simon Murray replaces John Rankin. Attempt saved. Edward Ofere (Dundee United) header from the centre of the box is saved in the bottom right corner. Attempt saved. Edward Ofere (Dundee United) header from the centre of the box is saved in the top centre of the goal. Substitution, Dundee United. Edward Ofere replaces Henri Anier. Corner, Dundee United. Conceded by Kevin Holt.